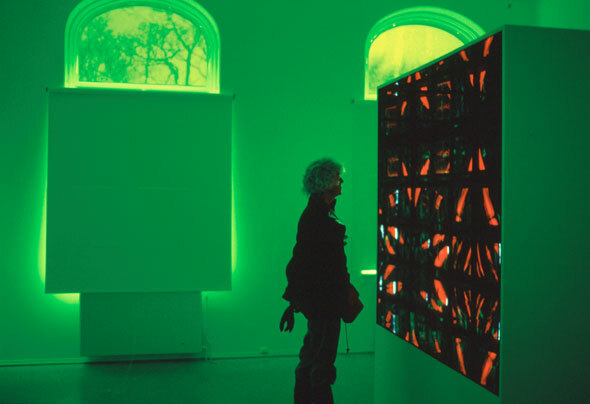 Video installation, "Strålende Bilder" ('Beaming Images'), Trondheim's Arts centre 1993, Norway. 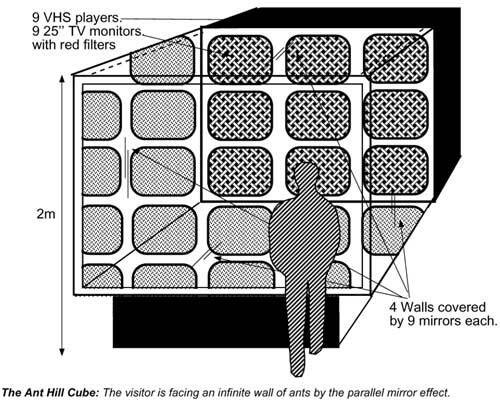 The mirrors produced an effect of an infinite wall of TV monitors showing giant ants rushing out of a hole to the sound of ants resembling a frenetic building site. A section of an anthill was shot with an infrared sensitive black & white tube video camera. A close-up-lens was used which reproduced an ant size of approximately 1/3 of the width of the TV screen. A 3 minute long scene was repeatedly copied onto 1 hour master tape which then was replayed on a 25 inch TV monitor. A section of the TV screen with the most aggressive ant-activity was partitioned in a 3 x 3 square matrix and each square was re shot directly from the screen, with the same camera and lens.The reproduction size of one ant, now covered approx. 3 TV-screens. The sound of the anthill was recorded separately from the video-image. A part of the anthill was moved into a cardboard box and installed inside a sound isolated room. The sound of the ants moving was recorded with a high sensitive microphone. It sounded like a building site with frenetic activity. This sound were used unprocessed just altering the speed, a little to fast, then correct and then a little to slow. The ants were returned to the anthill after their performance. The room was equipped with a light gate.